Hogar Cuencano is in the center of the city close to the central park, the historic church, many museums and the Tomabamba River. 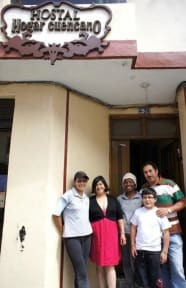 I had a fantastic time at Hostal Hogar. Comfy beds, amazing people, and a fantastic location. Thanks! I felt safe, secure and comfortable. The walls are so thin you can hear everything going on outside your room. I really enjoyed my time here though. Really great location and super clean private room. Room cleaned every day. Kitchen was lacking a few basics and the hot water took a long time to arrive once turned on, but it was hot once it came in. Excellent location, right in the centre, family run, extremely friendly. No lounge area. 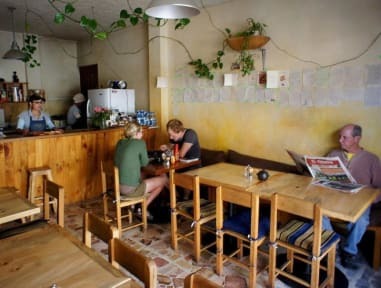 Comfortable bed, staff friendly, great location, close to shops, restaurants and supermarket. Water in shower is only lukewarm. Sheets didn't fit the bed properly and was very frustrating.